Today’s Pediatric Research Equity Act (PREA) was meant to help kids by requiring drug companies to also develop companion drugs for kids IF the adult drug they are developing is for the same disease as found in children. However, the drafters of PREA in 2002 did not foresee how drugs are developed with today’s advances in science. As a result, almost all childhood cancer drugs are exempted from PREA obligations because of loopholes. Because kids don’t get the same cancers as adults (breast, colon, prostate, etc. ), drug companies are not obligated to test for use in children. Of the 15 cancer drugs that have been FDA approved in the past three years, none have pediatric cancer PREA studies because they were all exempteddue to loopholes. Today’s PREA fails kids with cancer. he Kids Innovative Drugs (KIDS) Initiative will reform PREA so that the law meets up with today’s advances in science. KIDS will close the loopholes and improve the drug development process for childhood cancer. In 2015, there is a revolution in cancer treatment with new, targeted therapies that are curing certain terminal cancer patients. Today, instead of targeting certain organs, cancer drugs are developed by molecular target, and these molecular targets are present in both adult and pediatric cancers, but kids with cancer are not the first patients to get these drugs. Under today’s system, they are the last to get the drugs. 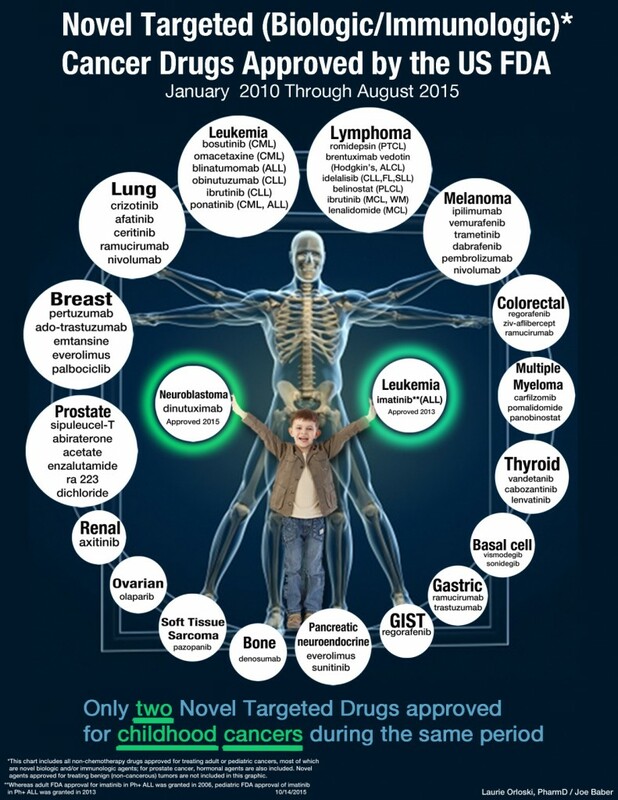 Notice in the chart below that in the last five years, there have been over 60 cancer drugs approved by the FDA for adults, but only two for children. One of the two (dinutuximab) is a direct result of the Creating Hope Act and the other (imatinib) is an adult drug found to be effective, safe and approved for use in children. Implementation of KIDS will help to create more opportunities for drug development for childhood cancers. Click here for a downloadable High Resolution PDF.file, suitable for printing, for the above chart. Cancer Drugs Approved by the US FDA 2010 – 2015 PDF. The Kids Innovative Drugs (KIDS) Initiative will close the loopholes. KIDS will provide that companies developing cancer drugs by molecular target will still have PREA obligations. (At this time, cancer drugs only have PREA obligations if kids have the same cancer by organ of tumor origin – eg prostate cancer). Second, the Kids Initiative will provide that companies developing targeted therapy cancer drugs will have PREA obligations even if they are designed for small subpopulations of extreme responders and can therefore qualify as orphan drugs. In addition, KIDS includes a voluntary program under which companies would start pediatric cancer drug development earlier in the drug development process and, as a result, earn a supplemental financial incentive. The Kids Innovative Drugs (KIDS) Initiative has already been endorsed by ten major hospitals and over 150 childhood cancer organizations, Including The Purple Society. If you or your organization would like to endorse the concept of KIDS, and be kept informed as we prepare to submit this vital legislation to Congress, please sign up here.